Farmland World is a concept amusement park chain that aims to reacquaint urbanites and suburbanites with our country's agricultural roots. Visitors to the theme park will don free overalls as they take part in typical farm chores. Farmland World areas include Goat Town, Wheat Island, Beeville, Chicken Hut and Fruit Mountain. Sound like a great vacation destination? Unfortunately, Farmland World is just a tongue-in-cheek concept. It was designed by Design With Company's Stewart Hick and Allison Newmeyer to shed light on how today's technological farming advancements have resulted in less personal interaction with animals and the earth. 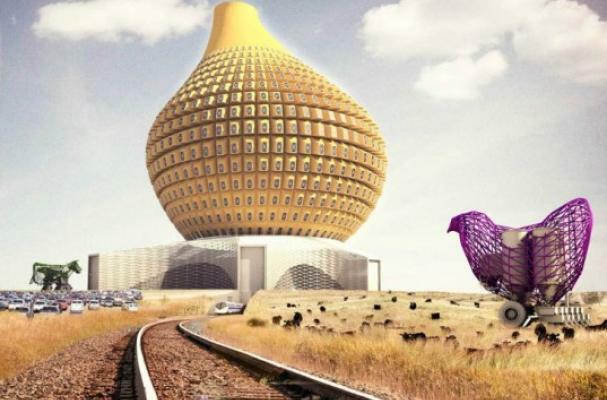 The Farmland World concept was the runner-up in the Animal Architecture design competition.